Gov. Andrew Cuomo was criticized after saying America “was never that great,” but his office offered some context later. “We’re not going to make America great again, it was never that great,” Cuomo said as some in the audience gasped in surprise. The governor also received critiques on social media. Later in the day, Cuomo’s press secretary, Dani Lever, issued a statement saying the governor does believe that America “is great” and was merely making the point that the nation’s greatness has not yet been fully realized because inequalities exist. Cuomo’s comments directly after his statement appear to bear that out. 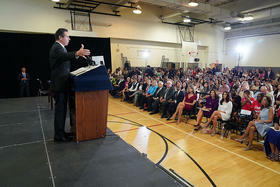 “We will reach greatness when every American is fully engaged,” Cuomo said. Lever said it is Trump who is implying, through his campaign slogan of “Make America Great Again,” that the nation is not great now. On Wednesday night, Trump tweeted, “WE’RE NOT GOING TO MAKE AMERICA GREAT AGAIN, IT WAS NEVER THAT GREAT.” Can you believe this is the Governor of the Highest Taxed State in the U.S., Andrew Cuomo, having a total meltdown!" In response, Cuomo tweeted: "What you say would be 'great again' would not be great at all...We will not go back to discrimination, segregation, sexism, isolationism, racism or the KKK. Like NY's motto says: Excelsior -- Ever Upward (not backward)"